Matthew Erickson Moore (born August 9, 1984) is an American football quarterback for the Miami Dolphins of the National Football League (NFL). He played college football at UCLA and Oregon State. He was signed by the Dallas Cowboys as an undrafted free agent in 2007 but was waived after the preseason. He played for the Carolina Panthers between 2007 and 2010 and has been with the Dolphins since 2011. After playing youth football for six years with Palmdale Youth Football (California), Moore attended William S. Hart High School in Newhall, California. He is part of Mexican American ancestry. As a junior, Moore lettered in football while playing as a safety, earning All-CIF acclaim with 80 tackles and 10 interceptions on the season. Moore lettered again during his senior year playing as Hart High School's starting quarterback. Moore led his team to a 13–0 record, culminating in a 42–13 win over Valencia in the CIF-Southern Section Division III title game. In the sectional, division title game, Moore completed 14 of 18 passes for 277 yards and four touchdowns and ran 15 times for 95 yards and one score. On the year, he completed 234 of 353 (66.3%) passes for 3,334 yards and 33 touchdowns and ran for 415 yards and seven scores. Moore was named the CIF-SS Division III Offensive Player of the Year. He was named First-team All-State and First-team All-CIF SS. He was selected to play in the 2002 North-South Shrine All-Star game. Moore ended his senior season as one of the top-rated quarterbacks in the nation. He was ranked No. 8 by Scout.com and No. 11 by Rivals.com. SuperPrep rated him as the No. 8 quarterback in the nation and named him the FarWest Offensive Player of the Year. Max Emfinger named him to his All-America team and ranked him as a four-star prospect and the No. 17 quarterback prospect. PacWest Football rated Moore a four-star rating and rated him the No. 6 quarterback in the West and No. 9 in the nation. PrepStar named Moore to the All-American team and rated him the No. 5 quarterback in the West. He was named member of the Tacoma News Tribune Western 100, the Las Vegas Sun Super 11 second team, the Los Angeles Times All-Star Team, and the First-team L.A. Times All-San Fernando Valley, which selected him as the region Player of the Year. Moore lettered twice in baseball playing shortstop and third base. Moore began his college football career at UCLA. He was slated to redshirt, but was pressed into duty due to injuries to Cory Paus and Drew Olson against Cal. He appeared in six games as a true freshman, becoming the first Bruin true-freshman quarterback to start since Cade McNown. The Bruins defeated Stanford in Moore’s debut, making him the first true-freshman QB in his first game to lead UCLA to victory. He led the team to seven scoring drives against the Cardinal. He saw action against Arizona, USC, Washington State, and New Mexico in the Las Vegas Bowl as a reserve. Moore was 7 for 11 for 64 yards and one touchdown in the annual rivalry game vs. USC. For the season he completed 33 of 62 passes for 412 yards, two touchdowns and no interceptions. Moore started four of the eight games he appeared in at UCLA. He threw for 555 yards, two touchdowns, and six interceptions as a sophomore, completing 52 of 103 passes. He started the season opener against Colorado, but suffered a leg injury that sidelined him for the next three games. He had difficulty regaining the starting job with just eight pass attempts over the next three games. He moved back in front of Olson on the depth chart for the Oct. 26 game at the Rose Bowl against Arizona State, passing for 190 yards and a touchdown in UCLA’s 20–13 win. He also started the team’s next two games against Stanford and Washington State. Moore transferred out of UCLA in 2003 (LA Times, Dec. 5, 2003). Moore did not play in 2004 while attending the College of the Canyons in Santa Clarita, California. Although he had not played baseball since high school, he was selected in the 22nd round of the 2004 MLB draft by the Los Angeles Angels after scouts saw him play in a Southern California semi-pro baseball league and invited him to private workouts with the team. Although he also strongly considered Colorado State, Moore enrolled at Oregon State in January 2005 and participated in spring training with the team. Head coach Mike Riley announced him as the leader on the depth chart entering the 2005 season. He finished the season with 2,711 yards passing, the ninth-highest total for a single season at OSU. His .594 completion percentage was third among the 20-best single season yardage performances in school history. Moore injured his right knee in the second quarter of the 10th game of the season against Stanford and missed the remainder of the year. His 271.1 yards passing per game was second in the Pac-10, trailing only USC's Matt Leinart (293.5). Making yet another record-breaking debut, he threw for 367 yards in the season opener against Portland State, the most ever by a Beaver quarterback in his first start. Moore threw for a career-high 436 yards against Arizona, had 317 yards at Louisville, and 311 against Arizona State. He hit Mike Hass on a 63-yard touchdown strike against Washington State that gave OSU the lead 37–33 after the team trailed 30–13 late in the second quarter. He also had two 58-yard passes—one to Anthony Wheat-Brown in the team’s upset of No. 18 California in Berkeley and the other one week later (again to Hass) in his return to the Rose Bowl. Moore started all 14 games for the Beavers and was an All-Pac-10 honorable mention leading the Beavers to a 10-win season capped off by a Sun Bowl victory against Mizzou. After a 2–3 start, Moore and coach Mike Riley received a great deal of criticism from fans. Both found redemption after winning the next 8 of 9 games. This streak included a win over #3 ranked USC and a Civil War win at home. On the season, Moore completed 229 of 378 passes for 3,022 yards and 18 touchdowns with seven interceptions. He set an Oregon State record for the most consecutive pass attempts without an interception with 183 before having that streak end in the Sun Bowl. He was named MVP of the Sun Bowl after throwing for 356 yards and four touchdowns and rushing for one touchdown. The 4 passing TDs were a Sun Bowl record. It was the second-highest scoring game in the Sun Bowl's 73-year history. He was 5-for-7 for 55 yards on the winning drive, setting up a 2-point conversion to put the Beavers up 39–38 with 22 seconds left to play. Moore was not selected in the 2007 NFL Draft, but was later signed as an undrafted free agent by the Dallas Cowboys. Despite completing 21 of 29 passes for 182 yards and one touchdown with no interceptions, while posting passer ratings topping 100 in two of his three preseason games, Moore was waived on September 1, with the Cowboys intending to sign him to their practice squad had he passed through waivers. He was claimed off waivers by the Carolina Panthers the following day. Moore saw his first regular season action October 7, 2007 against the New Orleans Saints in the 5th game of the season. Quarterback David Carr (who was playing in place of injured starter Jake Delhomme) left the game with a back injury after being sacked near the end of the first quarter. His first NFL completion was a 43-yard pass to Keary Colbert, but his playing time was brief as Carr returned to the field near the end of the first half. After a string of ineffective performances from Carr and Vinny Testaverde, Moore started his first NFL game on December 16, 2007 against the Seattle Seahawks. He led the Panthers to victory against the Seahawks while completing 19 of 27 passes for 208 yards without a turnover. After a tough loss against Dallas the following week, where he completed 15 of 28 passes for 182 yards, a touchdown and an interception, he went 15 of 24 for 174 yards, two touchdowns and an interception in a road win against the Tampa Bay Buccaneers. Moore was named NFL Offensive Rookie of the Month for December after these performances. In the last game of the 2008 preseason, Moore was injured and his left fibula was broken. He was put on injured reserve, and didn't play a single game during the entire 2008 season. Moore saw his first action of the 2009 Season when backup quarterback Josh McCown was injured during the Panthers Week 1 loss to the Eagles. Moore finished with 6 of 11 passes for 63 yards, 1 touchdown and 1 interception. Moore also played briefly against the Arizona Cardinals, attempting one pass which was incomplete. After starter Jake Delhomme broke his finger in a week 12 loss to the New York Jets, Moore started against Tampa Bay on December 6, 2009, the following week. He completed 14 of 20 passes for 161 yards and an interception, en route to a 16–6 Panthers victory. The following week he completed 15 of 30 passes for 197 yards and a touchdown in a 20–10 loss to the New England Patriots. On December 20 (in his 6th start) Moore had the best game of his career when he led the Panthers to a 26–7 upset victory over the Minnesota Vikings. In the victory he completed 21 of 33 passes for 299 yards, 3 touchdowns, and 0 interceptions, and improved to a career 4–2 as a starter. He drew praise from head coach John Fox and top receiver Steve Smith, who caught 9 passes from Moore for 157 yards and a score. On December 27 Moore completed 15 passes on 20 attempts for 171 yards, and for the second week in a row, three touchdowns and no interceptions, as Carolina beat the New York Giants 41–9. Moore had a career-high 139.8 passer rating. The victory came during the final game to be played in Giants Stadium and essentially eliminated the Giants from the playoffs. The Giants' home loss was their worst since 1998. Moore again drew praise from analysts, including Tony Dungy who said that Moore "looked liked a pro-bowler". Moore started the last game of the Panther's season on January 3, 2010, as the Panthers beat the New Orleans Saints 23–10. The Saints, who were the No. 1 seed in the NFC, were handed their third loss of the season as they rested most of their starters. The game was the coldest home game in team history for the Panthers. Moore completed 14 passes on 23 attempts for 162 yards and a touchdown. The win improved the Panthers to .500 with an 8–8 record (4–1 while starting Moore) to finish the season. 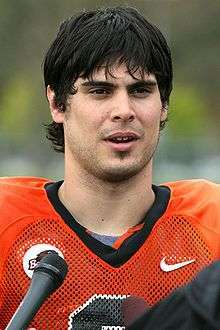 In his five games as a starter for the 2009 season, Moore threw eight touchdown passes with one interception. The strong finish by Moore and the Panthers, combined with earlier poor play by Jake Delhomme, led to speculation that Moore would challenge, if not replace, Jake Delhomme's role as the starting quarterback for the 2010 season despite Delhomme's large contract. This turned out be the case as Delhomme was cut from the Panthers on March 4, 2010. Moore was declared the starter for the 2010 season after Delhomme's release. Despite this, the Carolina Panthers drafted rookie Jimmy Clausen with their second pick (48th overall) of the 2010 NFL draft. Though Moore had clearly established himself as the Panther's number one quarterback, he faced pressure for the starting job from Clausen, possibly resulting in his poor play throughout the rest of the season. Moore suffered a concussion during the season opener at the New York Giants, and he was benched the following week in a loss against the Tampa Bay Buccaneers following poor play. On September 20, 2010, Moore was removed as the Panthers starting quarterback in favor of rookie Jimmy Clausen, after throwing 4 interceptions in the first two games. After sitting out for 3 straight games, Moore was again declared the Panthers starting quarterback on October 18, 2010, following poor play by Clausen. In his first game back as a starter against the San Francisco 49ers, Moore completed 28 passes on 41 attempts for 308 yards, two touchdowns and one interception, setting career highs in yards and completions. In a week 9 loss to the New Orleans Saints, Moore injured his shoulder after a hit from Sedrick Ellis. He was placed on injured reserve by the Panthers, ending his season. Moore in a game against the Buffalo Bills in 2011. Moore was signed by the Dolphins on July 28, 2011 to back up Chad Henne. He switched numbers, from 3 to 8. On October 2, 2011 Moore entered the game against the Chargers in the 1st quarter after Henne went down with a shoulder injury. He completed 17 of 26 passes for 167 yards and an interception, compiling a 67.3 quarterback rating. On November 6 he became the first Miami quarterback since Chad Pennington in 2008 to throw three touchdown passes in a game, in their 31–3 win over the Kansas City Chiefs. He repeated that feat in week 11, blowing out the Bills 35–8, and had the highest QB rating of the week. In 2012 he was announced as the Dolphins' 2011-2012 season MVP. During the offseason, Moore was battling for the starting QB role against newly drafted Ryan Tannehill and newly signed David Garrard. Moore became the second quarterback. On November 28, 2012, in a Week 8 game against the New York Jets, Moore went in for Tannehill after he left the game with injuries to his left knee and thigh. Moore went 11 for 19 on his passes with a touchdown to lead a 30-9 victory over the Jets. On March 8, 2013, Moore re-signed with the Dolphins, agreeing on a two-year deal to remain a backup for Tannehill. ↑ "Dolphins Vs. Bears (27-14) Recap". Retrieved February 19, 2016. ↑ "Matt Moore's in for Jake Delhomme in Carolina, So Expect Good Things". Bleacher Report, Inc. December 1, 2009. Retrieved June 12, 2007. ↑ "Matt Moore Draft Profile". FoxSports.com. Retrieved June 12, 2007. ↑ "Player Bio: Matt Moore". UCLA. Retrieved April 17, 2010. ↑ "Oregon State QB's interception-free streak ends at 183". ESPN.com. Associated Press. December 29, 2006. Retrieved April 30, 2007. ↑ Buker, Paul (April 30, 2007). "Giants pick Koets; tight end, Moore sign deals". The Oregonian. Retrieved April 30, 2007. ↑ Fentress, Aaron (December 20, 2009). "Matt Moore and Jonathan Stewart lead Carolina to 26–7 upset victory over Minnesota". OregonLive.com. The Oregonian. Retrieved December 21, 2009. ↑ Fentress, Aaron (December 27, 2009). "Jonathan Stewart and Matt Moore help Carolina humiliate the New York Giants, 41–9". OregonLive.com. The Oregonian. Retrieved December 27, 2009. ↑ "Panthers wallop New York in final game at Giants Stadium". NFL Game Center: Carolina Panthers at New York Giants – 2009 Week 16 (NFL.com). Associated Press. December 27, 2009. Retrieved December 27, 2009. ↑ "Football Night in America". Football Night in America. 2009-12-27. ↑ Triplett, Mike (January 3, 2010). "New Orleans Saints 'comfortable' with position after third loss". The Times-Picayune. nola.com. Retrieved January 3, 2009. ↑ "Panthers hand Saints their third consecutive loss". NFL Game Center: Carolina Panthers at New Orleans Saints – 2009 Week 16 (NFL.com). Associated Press. January 3, 2010. Retrieved January 3, 2010. ↑ "Panthers surge saves coach's job". HAARETZ.com. Associated Press. December 31, 2009. Retrieved December 31, 2009. ↑ "For the Carolina Panthers, It's Open QB Season". Bleacher Report. 2011-10-09. Retrieved 2011-10-13. ↑ "Matt Moore – Miami Dolphins – NFL – Yahoo! Sports". Yahoo! Sports. Retrieved November 7, 2011. ↑ "Matt Moore re-signs with Dolphins". Retrieved February 19, 2016. ↑ "Dolphins keep backup quarterback Matt Moore". Retrieved March 15, 2016. 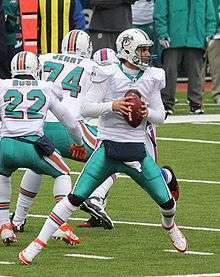 Wikimedia Commons has media related to Matt Moore (American football).